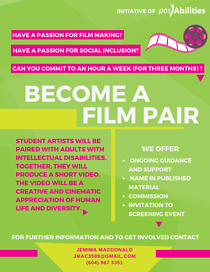 Have a passion for filmmaking and social inclusion? Become a Film Pair! Become a Film Pair in a new initiative that links student artists with people with intellectual disability. Together, each pair will produce a short video (between 2 and 5 min long) that focuses on the creative and cinematic appreciation of human life and diversity. This project, commissioned by posAbilitites, will promote the idea of self representing, sharing stories and experiences. It is also about showcasing the talents of people with intellectual disabilities as producers, actors and directors. Student artists do not have to be film majors to apply! Please contact Jemima MacDonald if interested.